Seize the moment and spend a couple of magical nights in a private hideaway among the trees – with personal Jaczzi! 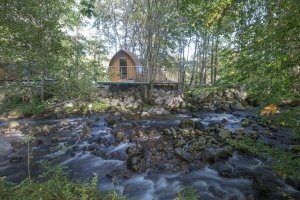 Bubble the night away in your luxurious hot tub, as you look up at the stars overhead and chat about the plans for tomorrow: a day of adventure in the stunning Glencoe area. And then tumble into Egyptian cotton bed-sheets, atop our special, magical mattress – for the best night’s sleep this year! You are starting to dicover the wonders of these luxurious tiny hotels! Simply use the promo code “ESCAPE” when booking over the phone today to secure a one-night stay for just £190, or two nights in paradise for just £290 for both nights! That’s over 50% off NORMAL prices! Look at the calendar below to make sure your dates are available. This very special offer is only available from now until the end of March (excluding school holidays etc.). Stay 1-night mid-week in a lodge with hot tub for just £190, or 2-nights mid-week for the very special price of just £290. If you’re only able to escape on weekends, that’s no problem either – simply pay a supplemental charge of £40 for a Friday or Saturday night. This offer is likely to sell out quick, so call us immediately on 01855 413 006 to avoid disappointment. Simply state the desired dates, and quote the promo code “ESCAPE” to secure your discount. Have your debit/credit card details handy as we’ll need payment in full to secure your booking. The offer is only valid for bookings made over the phone (9am – 6pm, 7 days a week), and cannot be claimed online.